Form K-40V may be used by individuals to pay their individual income tax. 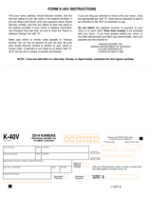 When mailing Kansas Form K-40V, individuals must make the check payable to Kansas Income Tax and include their SSN. If the taxpayer misses the April 15th deadline, he or she will have to include penalties and interest charges with the tax payment.